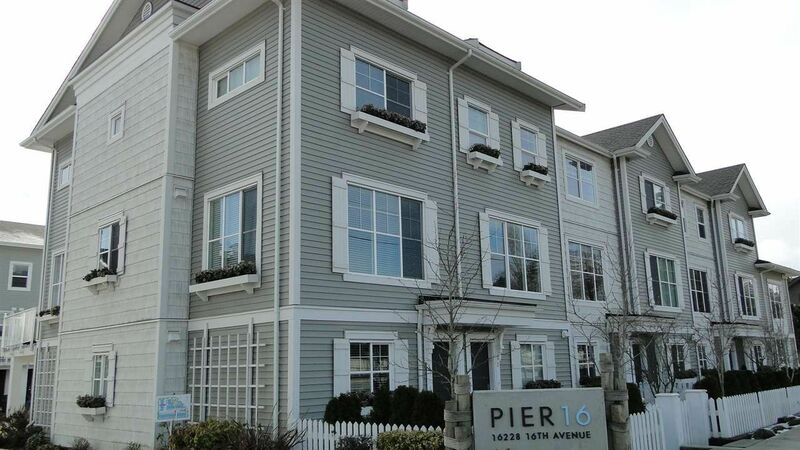 "PIER 16" This fantastic PRIME LOCATION END UNIT has greenbelt on the west side of home & nobody directly behind you. Home is very bright & has lots of windows. Kitchen has white cabinets, quartz countertops, s.s appliances, built-in microwave oven & a large work island with breakfast bar. Master bedroom has 5 pc ensuite. Nice wood flooring in foyer & main floor. Location is at the back of complex. Visitors parking is to the side of home. Complex has a child's play area. Just minutes to access highway 99 & close to all amenities, DON'T MISS THIS ONE!